Thankfully, Martin and Philip are invited to a summit in Atlantis for all of the leaders of the time-traveler colonies, and now Martin thinks this will be a chance to try again with Gwen. Of course, this is Martin Banks we’re talking about, so murder, mystery, and high intrigue all get in the way of a guy who just wants one more shot to get the girl. 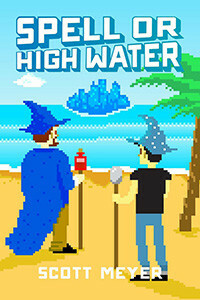 The follow-up to the hilarious Off to Be the Wizard, Scott Meyer’s Spell or High Water proves that no matter what powers you have over time and space, you can’t control rotten luck.